London is leading the way: Its “Roads Task Force” (RTF) has published a comprehensive report, recognising that “speed limits play an important role where ‘movement’ and ‘place’ need to be better balanced, where there are high levels of pedestrian activity and where safety issues have been identified”. The vision is to get “world class streets, fit for future”. RTF is stressing the importance of 20mph to encourage Londoners to walk and cycle. 20mph improves safety, attractiveness and ambience. The “Roads Task Force” (RTF) was set up by the Mayor of London in July 2012 to look at long term solutions to the challenges facing London´s roads, principally congestion and population growth. As London’s population grows by an expected 1.25 million people by 2031, congestion will also rise by an anticipated 14 per cent despite a programme of combative measures and investment. The “Roads Task Force” can make recommendations to the Greater London Authority and the Mayor of London as well as to “Transport for London” (TfL) who manage the roads network. That does not mean however that their proposal already decided. It needs TfL’s support and action to be implemented. RTF published their report on 10th July, with TfL´s response published on the same day, expressing that they support 20mph as a lower speed environment. TfL will work to make London’s roads safer through lower traffic speeds wherever appropriate. 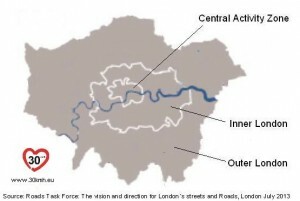 RTF is recommending the Central Activities Zone (i.e. West End, The City and Southbank) to be area-wide 20mph. 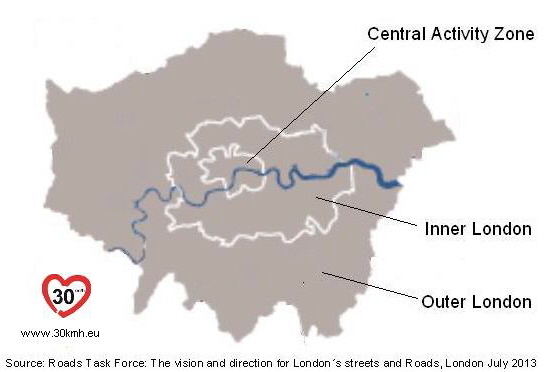 They also favour a 20mph zone for central London (plus bridges), rolling out 20mph limits linked to key street types (e.g. high roads/high streets/city hubs) and average speed cameras. Our British partners welcome the RTF report. Rod King, founder of the NGO “20´s Plenty for Us” Founder commented : “This is consistent with the developing view that 30 km/h is the right speed limit for most urban streets. It also highlights the need for our “It’s Time For 20” call.” 20 mph (30 km/h) as regular speed limit would enable it to be far cheaper for local authorities to implement the lower speed limit. As TfL´s response is more tentative than RTF´s report, there will still remain some work to do though. – Roads and streets make up about 80 per cent of London´s public space. – Every day, around 24 million journeys take place on the UK Capital’s roads. – 80 per cent of all trips made by people and 90 per cent of all goods moved in London every day are on the roads. – The traffic congestion is estimated at £2bn in lost business every year.